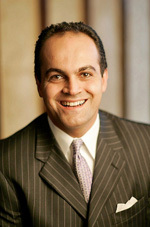 My friend David Nour has just released his fourth book, Return on Impact: Leadership Strategies for the Age of Connected Relationships (ASAE, 2012), and not a moment too soon. In this resource-rich book, David elevates social from “doing”–networking, media, and collaboration–to “becoming” a more socially enabled organization through social market leadership. I find David’s point of view refreshing. He proffers a fundamental mindset shift, provoking us to become more customer-centric in an age where empowered customers have far greater access to real-time information, connections, and company advocates. We must make the shift because governance in most organizations is outdated as social media and networks force us to think and lead differently. LISA NIRELL: You interviewed over 100 association and corporate senior executives for this book. What led you to the conclusion that the impact of social media is more than just picking the right tools and sending out e-blasts, contests, and announcements? DAVID NOUR: One of the questions I asked in my interviews was “Do you have a social strategy?” The resounding response was “YES,” but after further discussions, it turned out to be a very tactical approach using much of the current social media tools, primarily for marketing purposes. I equate that to the tail wagging the dog! Visionary leaders see social as a business accelerant in their organizations. They are putting their customers, shareholders, and employees at the center. They are developing a robust social strategy, attracting world-class social talent, changing their governance policies, and leveraging social analytics to become more agile and nimble and tell great stories. They’re learning from intentional failures to move their people, teams, and organization forward. How is social media affecting the growth planning among your B2B clients? Why is Porter’s Five Forces model being challenged? Social is a great “signal scout,” and brings faint signals to any organization. If the organization is savvy and agile enough to listen louder and apply those faint signals to their products or services, it can take advantage of key market opportunities faster than its competitors. That’s where profitable B2B growth comes from. I have a lot of respect for Michael Porter and his Five Forces model as a strong asset to the field of strategy. What Porter didn’t have decades ago was social networks, media, or engagement. He couldn’t have predicted the dramatic effect that a more holistic customer lifecycle, influencer marketing, and unique buyer types would have on the bargaining power of buyers. Many of his definitions of buyer concentration, buyer volume, switching costs, buyer information, buyer input, the ability to backward integrate, and decision-makers’ incentives were myopic given the information and resources he had at the time. Porter wasn’t challenged with the relationship between social influencers, brand affinity, and purchase decisions across different industry verticals. In essence, social influence positioning hadn’t been invented yet. Equate this to turbocharging Ford’s Model T.
Give us a high-level summary of your IMPACT model. Immerse-Member-Participate-Accredit-Community-Transform. Immerse as broad of a market into your unique value-add and focus on how they’re better off because of you. Those who get it and matter will seek you out and will want to become members with exclusive privileges. Create world-class engagement opportunities for them to participate and get even more value from their investment of time, effort and resources. Accredit them through personal and professional growth so their knowledge, talent, skills, and access to influential relationships make them more valuable in their markets. Develop a community of like-minded individuals who grow still through their interaction with one another. Finally, transform their situation. Only when they are truly transformed will they become evangelists for you. You provide a comprehensive IMPACT scorecard to help leaders assess their social networking effectiveness. Who is using this today, and what are they learning from it? The IMPACT Scorecard is more than an assessment tool for social networking effectiveness; it really is a benchmark mechanism against your competitive peers. We are currently implementing it and tracking our progress against it among a dozen global clients.They range from global account teams at a Fortune 50 client to a 40 year old trade association desperately trying to evolve beyond its legacy to its future. How will social networking inform B2B marketing planning in 5 years? I think marketing is going to continue to evolve from one-to-many to one-to-one. Back in the late ’90s, Don Peppers and Martha Rogers were the parents of 1-to-1 marketing. I think in many ways, they were 20 years ahead of themselves. What social networking is doing to marketing is really elevating and validating 1-to-1 marketing. Organizations who are savvy enough to learn from the social networking dialogue (vs. the monologue many practices today) to understand an individual’s needs, wants, and tastes will benefit from what socioligists refer to as being “ambient aware.” The more they learn about their customer’s digital footprints, the more they can cater to that individual’s experience. It’s thinking and leading differently because of social. 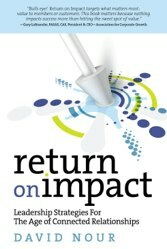 It’s return on impact! Maximize the impact of your social strategy. Buy David’s book and watch your social “savoir faire” soar.